This discussion was created from comments split from: Is it possible [or will be] to slice beat in NS2?. @Will what about creating section "Tricks and Worklflow suggestions"
or something like that... this is good candidate for such section... i will then put there also my "autobeat replacement"
Agreed. Maybe "Tips and Tricks" so that it matches the manual? Feel like it would be best if it were somewhat curated but Vanilla doesn't exactly make that easy. Cool to see someone using the tools in the app first before just requesting a new feature. New features could be cool and all, but the features in the app now we can use now. I hadn't thought of doing it the way you are, but I'm not a beat-slicer. Maybe now I'd give it a go. Good work around, but I agree that the sample editor should have the ability to set non-destructive start/end points. 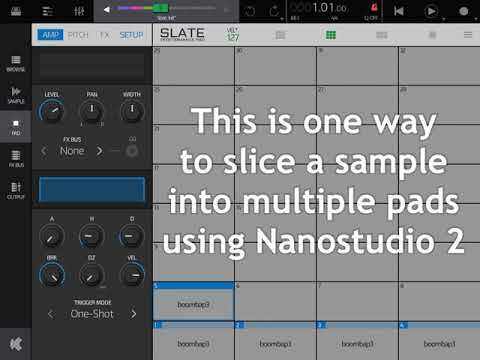 The icing on the cake would be to have the ability to set up to 32 slices (either as transients or regular beat intervals), and then generate a new Slate kit and MIDI sequence than you can paste into the Slate instrument and the pattern editor respectively. BTW sort of related - I notice that @King had mentioned that the sample offset knob settings don't correspond linearly to the start offset actually applied to the sample. This is by design - the idea is that you often want very fine control near the start of the sample to knock off a small attack transient. So if you have (for example) a drum sample which last 2 seconds, you get fine control over the first few milliseconds and then courser control over the rest. My intention was ultimately to set the non-destructive start/end in the sample editor (as mentioned above) but I had to push that back to a future update. @Blip Interactive non-destructive start/end points in the sample editor would be an improvement, multiple slices with export would be above and beyond! Incorporating a MIDI sequence generator seems novel, though I can understand how it could be convenient having an audio+MIDI version of an audio loop (could be used to effectively emulate time stretch for users who want to speed up drum breaks without changing pitch). I have noticed that the higher the OFFSET the less precise it is for nailing the start point, while end points can be dialed in finer between the Amp Hold and Decay settings. That makes it difficult to use this method to isolate individual hits towards the end of a drum break, but it's usually close enough for ambient or vocal sample chops in my experience. Interested to see where you go with this.